It was totally dark. The lights in the city were turned off, and there were no street lamps, no neon signs, and no extra glow in shop windows. Klaus noticed that theirs was the only car on the road. How would they slip by the checkpoint? Klaus glanced at his wife Tina, whose eyes were shut in prayer. Suddenly he heard a thunderous crash, then saw a bright flash of light. 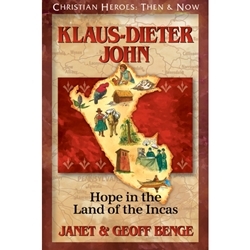 Klaus-Dieter John dreamed of becoming a medical missionary in the developing world. He would do whatever it took -- study in top universities and practice surgery in remote and dangerous places -- to reach his goal of providing health care for people who needed it most.